Dastardly billionaire Elon Musk, the mastermind behind Tesla Motors and SpaceX, has announced he will be build a test track for his fabled Hyperloop transport system. Described by Musk as a “cross between a Concorde and a railgun and an air hockey table”, the Hyperloop will propel capsules through a partial vacuum inside a continuous steel tube at 700 mph. It was proposed by Elon as a cheaper and faster alternative to California’s hugely over-budget high speed railway. Theoretically it would cut the 354 mile journey from LA to San Francisco down to 35 minutes. 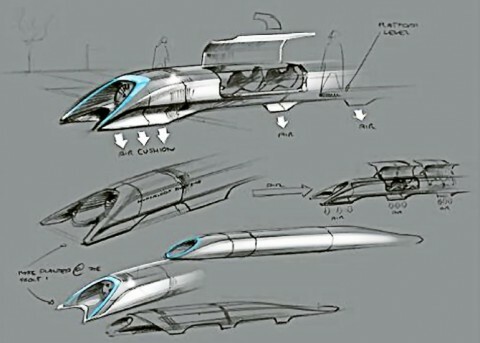 Musk’s initial estimate for the Hyperloop’s building costs were $6 billion – some $60 billion cheaper than the proposed railway. It makes you wonder about our very own unloved and over-budget high speed rail project. Maybe if HS2 Chief Executive Simon Kirby, the anonymous corporate drone earning £750,000 of taxpayers’ money a year, had a bit more entrepreneurial spirit, we wouldn’t be about to face a £50 billion bill for a slightly faster train to Birmingham. Phase one of of HS2 is due to be completed by 2026, which coincidentally is the year Elon Musk has promised to land humans on Mars.